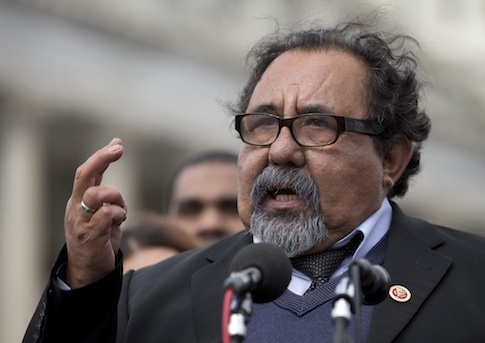 Rep. Raul Grijalva (D., Ariz.) was very concerned about the potential financial benefits of approving the pipeline for the federal contractor that conducted an environmental review of the project last year. The review found that Keystone would have minimal environmental and climate impacts. Grijalva suggested that the contractor’s vague financial ties to TransCanada, the company building the pipeline, compromised the objectivity of its analysis. Grijalva was the lead signatory on a December letter to President Barack Obama asking him to delay any decision on the pipeline in light of allegations that the contractor had failed to disclose prior work it had conducted for TransCanada. "If the allegations that ERM lied to the Department of State about its conflicts of interest turn out to be true the Department of State must conduct a new EIS that is not tainted by conflicts of interest," Grijalva and 24 other House Democrats wrote. The State Department’s inspector general later concluded that there was no conflict of interest in the contractor’s environmental review. However, Grijalva may have faced his own financial conflict even as he warned of the potentially compromised positions of those supporting the case for the pipeline’s construction. According to disclosure forms filed last year, Grijalva’s wife bought between $1,000 and $15,000 in stock in a major Canadian oil pipeline company just months before the congressman penned his letter to Obama. The company, Enbridge Energy Partners, is Canada’s largest transporter of crude oil and is a direct competitor to TransCanada. Enbridge is expected to benefit as Keystone continues to languish in bureaucratic limbo awaiting a go-ahead from the Obama administration for its southern leg, which would carry Canadian "oil sands" crude to the U.S. Gulf Coast. A source familiar with the congressman’s investment decisions confirmed to the Washington Free Beacon that the exact amount of the purchase was $2,334.75. That sum, the source said, was too small to be considered comparable to the conflict the congressman had alleged in the contractor’s environmental review of the pipeline. Mrs. Grijalva sold the stock in February, additional disclosure forms show. The source explained that she made the investment through a brokerage, and that she did not specifically select Enbridge stock for purchase. However, pipeline supporters say environmentalists would have made hay of the investment if the apparent conflict implicated parties to the project or its backers in Congress. "In a logical world, Rep. Grijalva’s direct connection to TransCanada equity would spark outrage from environmentalists in general and the fossil fuel ‘divestment’ crowd in particular," said William Yeatman, a senior fellow in energy policy with the Competitive Enterprise Institute. "Of course, they’ll give him a free pass, because he carries their water in Congress," Yeatman added. Other Keystone opponents have faced similar conflicts of interest. A trust owned by Sen. Tim Kaine (D., Va.) is invested in Kinder Morgan Energy Partners, another TransCanada competitor that would likely benefit if Keystone is rejected. Keystone detractor Rep. Alan Lowenthal (D., Calif.) has funds invested in both Kinder Morgan and Enbridge. "This is not an ‘appearance of conflict of interest,’ it is a bald-faced conflict of interest," Ron Arnold, executive vice president of the Center for the Defense of Free Enterprise and author of Ecology Wars: Environmentalism as if People Matter, told the Free Beacon at the time. Update, July 30, 3:12 p.m.: This post has been updated to note that the investment was in the amount of $2,334.75, not $2000.97. This entry was posted in Issues and tagged Keystone, Raul Grijalva. Bookmark the permalink.